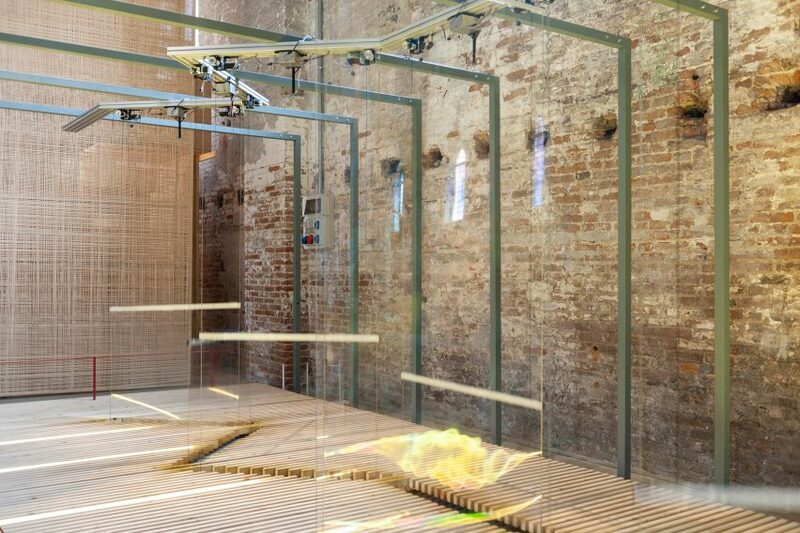 Riccardo Blumer Atelier worked with a team of students to create this machine on show at the Venice Architecture Biennale, which is programmed to build and repair an 11-metre-long bubble wall. 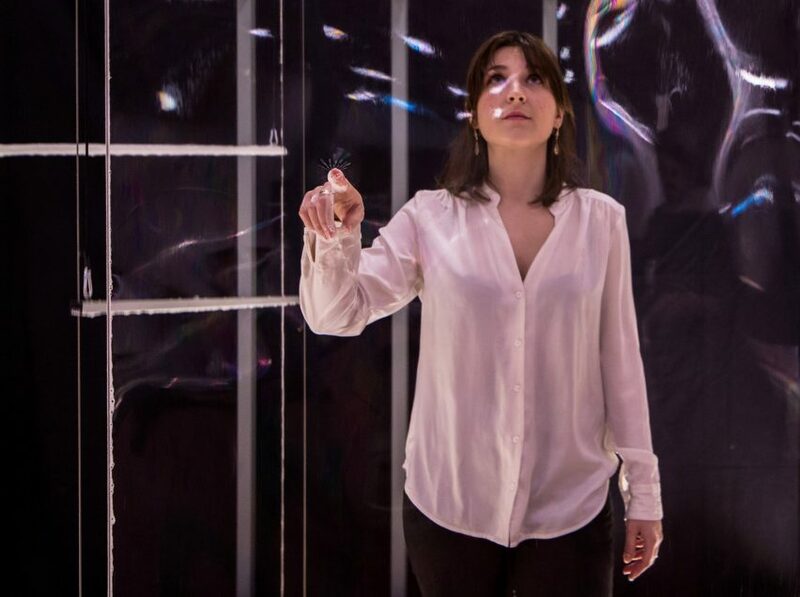 The robotic installation, called Wall, is designed to highlight the limitations of physical boundaries. It is programmed to fulfil one goal: maintain a complete wall-like structure made up of eleven bubble-like segments for as long as possible. It achieves this by lifting rods dipped in a solution of soap and water up from from the ground, creating a series of transparent bubble-like surfaces that measure one metre wide and two metres high. These walls are held in place by the rods as they reach their finishing position and barely visible as light is reflected off them. 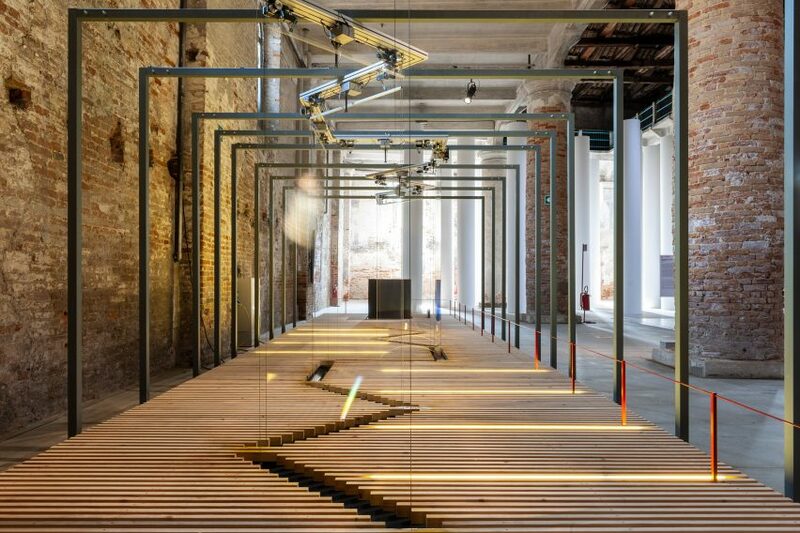 The project is on show in the Arsenale, one of the two main venues curated by the Venice Architecture Biennale directors for 2018, Yvonne Farrell and Shelley McNamara of Grafton Architects. It was designed by Academy of Architecture in Mendrisio students Lorela Arapi, Stefano Clerici and Andrea Cappellaro, and produced in collaboration with Riccardo Blumer, the school’s director. “It is a work designed by the students and the idea was to work with the limits of the architecture but also with automation,” Blumer told Dezeen. 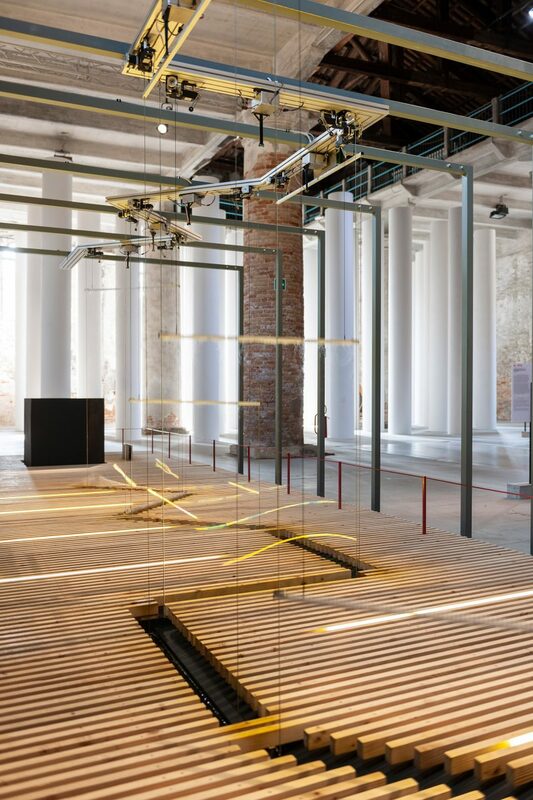 Unlike some work at the exhibition, Wall was not created specifically for the biennale – Farrell and McNamara saw it on show at the school and asked for it to be recreated in Venice, in line with their theme Free Space. “The project was part of an exhibition called Seven Automatic Architecture, so there were seven of these machines,” said Blumer. Despite the squeegee-like blades all beginning in sync with each other, they almost immediately become disjointed, granting each of the fragile surfaces a varying lifespan before they pop and the process starts again. 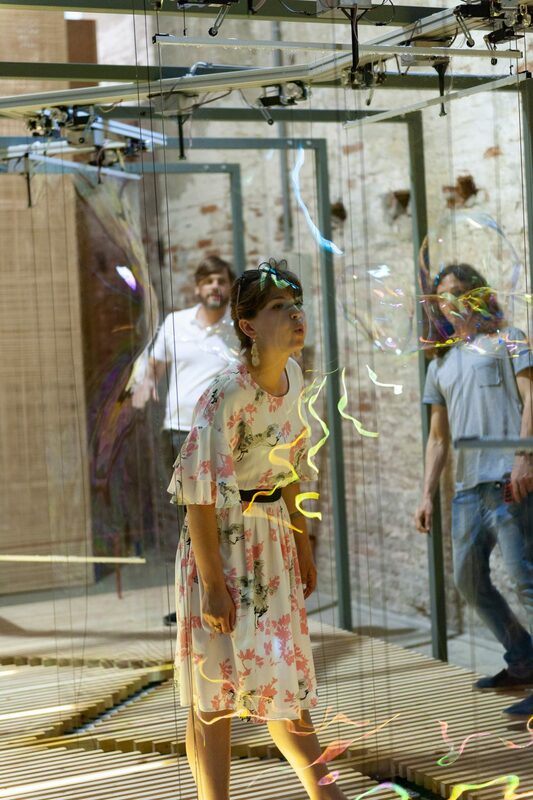 Viewers are also invited to step in close to intervene with the walls, with many opting to poke through and destroy the sheets or blow large air bubbles, affecting their form. The designers see these interactions as an exploration of the notion of a wall as a boundary, and proof of its fragility as an element of architecture. “These students have chosen to work on a minimised, almost non-existent version of a wall, whose presence is given only by light and time,” said Blumer. Despite any political interpretations that might be made of the concept, the 59-year-old architect is keen to stress that the project was borne from a desire to teach students about the importance of play within their architectural education. 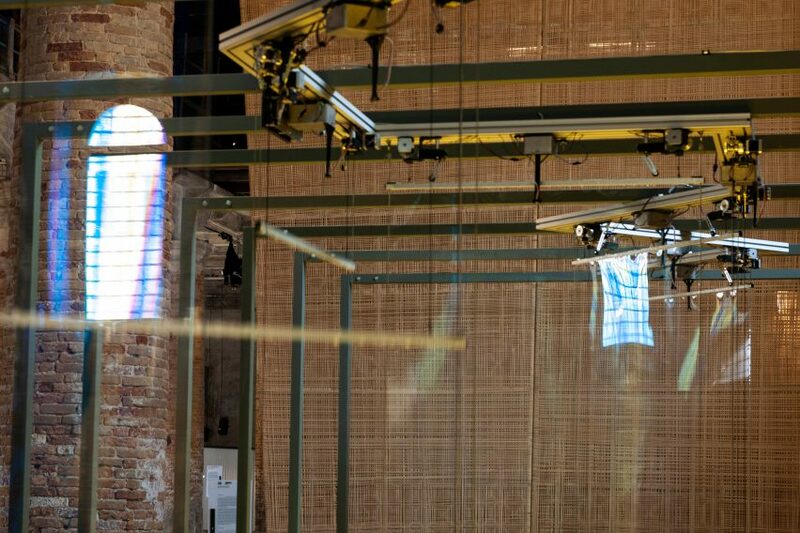 Visitors to this year’s Venice Biennale can also view another project from the Seven Automatic Architecture exhibition, which merges artificial intelligence with dynamic architecture. Space, by Greek student Georgios Voutsis, is a grid of 81 wooden towers that constantly adjust their height in response to a geometric algorithm, creating an ever-shifting landscape. Both projects were brought the exhibition with the support of The Martin Architecture and Design Workshop. They will be on show until the biennale ends, on 25 November 2018.